This is our beloved Coffee Bar. We have had it in our home for almost two years and we love it more each day. :) However, it is used every day, multiple times a day. It is also directly across from the garage door (where we enter and exit the house). Therefore, it often becomes a catch-all. 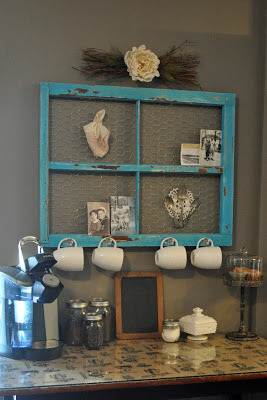 So, this is a picture of the coffee bar I took for the blog post two years ago. Below is a picture of the coffee bar as it looks this very moment. The above picture lives on Pinterest, the below picture lives in the real world. 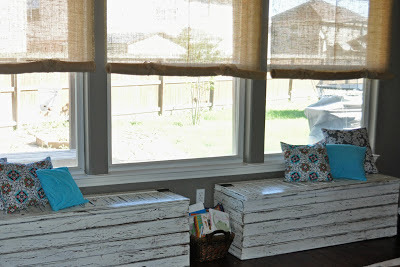 Another of my favorite projects are the Distressed Window Seats my husband built. Let me just say that our throw pillows are just that - they are always thrown on the floor or all over the couch. I have kids. Kids do not sit and merely lean against a throw pillow. They roll, walk, throw, and of course use them as weapons. Here is a picture that was used for the original blog post. We recently bought a new couch which is much larger. We had to move one of the window seats up to our master bedroom to allow more space for the couch. The below picture is what the lone window seat looks like right now. :) Let me just say, we have walked past those throw pillows approximately 62 times today...no one has picked them up. Again, the above picture lives on Pinterest and the below lives in the real world. This is the same table and pitcher of flowers just a few days later. Because the first picture is such a tight shot, I could have easily cleared the middle of the table, pushing everything to the side, straightened out the cloth under the pitcher, zoomed in and got a beautiful, tidy picture. Happy Monday - I need to go clean!